Time to dive a bit deeper in our Proof of Concept. In our previous post we gave a high level introduction into our Blockchain for Peer review initiative Proof-of-Concept. We got a lot of questions in the mean time, mostly you were keen on understanding what we exactly store on the blockchain. Hence time to dive into a bit more details! Increasing difficulty in finding and identifying suitable and available reviewers. This is due to the growth in research outputs, including rapid growth from emerging economies. Lack of transportability of review. Lack of transparency and decreasing trust in this process. This initiative aims to open up the blackbox of the peer review process. In order to make the process more efficient, transparent, and trustworthy, we aim to create a neutral infrastructure for sharing peer review data in the ecosystem with respect to the confidential nature of the process. This initiative’s aim is to build a solution that will equally benefit all participants, including publishers, funders and institutions. Below you see the high level overview of the architecture we build for the Proof of Concept for the Blockchain for Peer Review initiative. We start with extracting data from the publishers’s Manuscript Management Systems’ internal databases. This information we parse into various pieces of data. These processes all happen within the publisher’s firewall in order to comply with the General Data Protection Regulation (GDPR). In the diagram below, everything within the orange dotted line are the processes within the publishers’ firewall. The extracted data is distributed in various places of which one of them is the blockchain and, in our Proof of Concept, the other is ORCID. The Peer Review Query system, a part that remains within the publishers’ firewall, allows publishers to open up parts of their peer review data to external parties which they may not want to store on the blockchain for various reasons. The User Management System represents the user-facing interface, for instance a web-based User Interface, to interact with the various pieces of the system to retrieve data. Personal data — the data which can identify reviewers on a personal level. This data, falling under GDPR in Europe, never leaves the publishers systems unless there is a specific agreement with the reviewer. This data will never be stored on the blockchain. Public Data — data that are relationships between various entities which comes from the internal systems. For instance the state in which a review is in, other relevant meta data and the permissions to access the internal data. We store information to be able to prove that a certain relationship exists and to prove the reviewer has performed a specific review. Internal Data — this data we normalise and store in an internal database. This can be sensitive and confidential data, data which could give competitive advantage for instance. The publisher doesn’t wish to share this data with others per se, or at least not without a permissioning layer. The intent is to develop a very sophisticated and fine-grained permissioning system on the blockchain which would grant permissions to be able to query this data. Diving a bit deeper as to what we store in the blockchain. The manuscript id, journal and timestamp, non-personal identifiable information, is extracted from the publishers data. 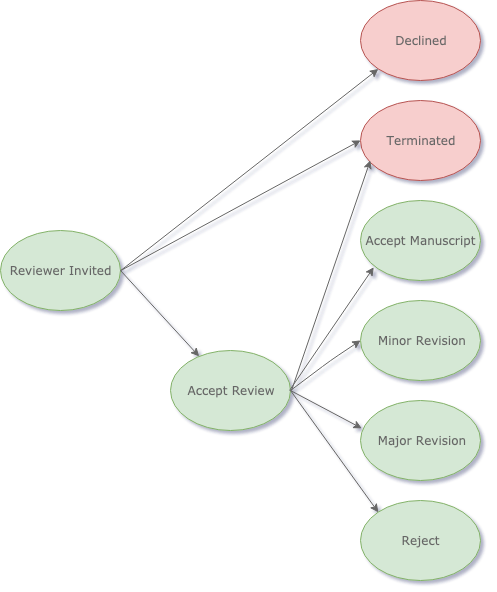 The Review State in this Proof of Concept is determined by analysing sample data of 26 journal files extracted from Editorial Manager and identifying the overlaps. The review state states for instance if the reviewer has been invited, has accepted the invitation, or if she or he is not responding to the invitation, etc. These states are stored and connected to a manuscript and an entry to which the reviewer can claim with their public key that she or he was part of the peer review process. The reviewer’s name is never stored as is on the blockchain to avoid revealing someones identity. Before storing the data on the blockchain, we process the reviewers data by removing the reviewer from the data set and replacing it with a random shared secret instead. Using the reviewers public key, this secret is encrypted as a shared secret: the “reviewer encrypted shared secret reviewer”. This shared secret cannot identify the reviewer at all as it differs per manuscript. Using the publishers private key the secret is signed creating: the “publisher signed shared secret”. These shared secrets, which we store on the blockchain, are random generated secrets between the publisher and the reviewer. This means that a reviewer can prove when showing the shared secret that she or he is part of the relationship or in other words that they had performed the review. Anyone who has been given the shared secrets or a proxy to the secret can verify with the publishers public key that they were part of the review. Authentication to the publisher is given by the fact that they can prove to external parties that they were present when the secret was generated. The information stored on the blockchain itself is meaningless unless you can prove the secret. 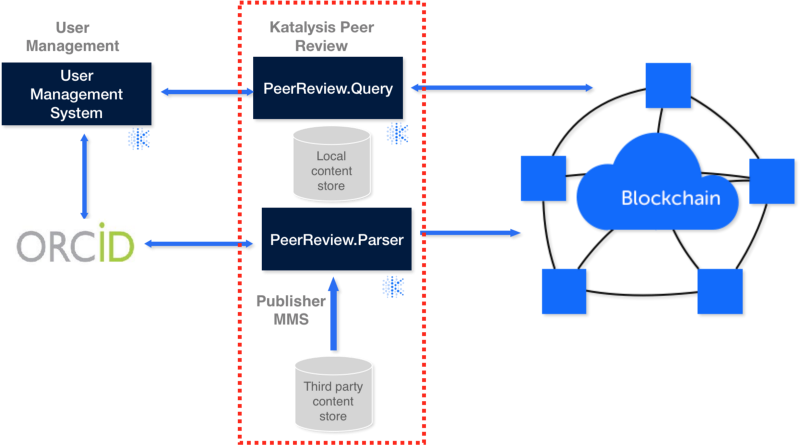 The next phase for us is to integrate the parser and the query server into a single node; a peer review node. This node will run on the publishers premises. This allows the publisher to exchange data when given the permissions from both ends. Of course when a third party is involved falling under GDPR regulations their consent is required as well. 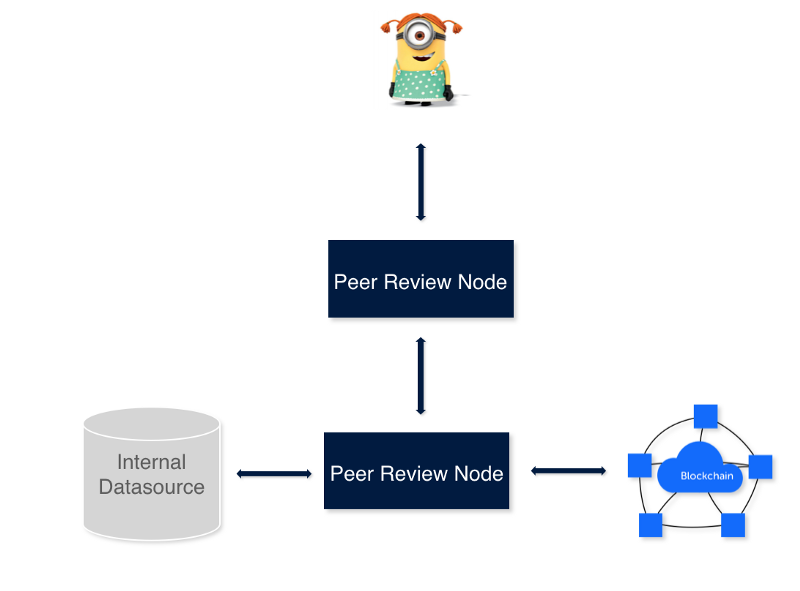 The peer review node aggregates data from multiple nodes, sends data to permissioned parties and confirms veracity of review claims. Furthermore it processes the data into the blockchain.